15. Inventions. The Experimental Garden. Issue 42. 16. Flower sharing and depression – giving your garden to others. Issue 43. 17. Noise in a garden. Issue 44. 19. Garden of the future. Issue 46.  So passers-by are always surprised and delighted by what flowers next.  So I can give people and op-shops cut flowers, or at least a bunch of parsley. Sometimes I give a flower to children on the train. If people already have the weed oxalis I can give away plants, without spreading it further.  A garden that can get by with as little or as much work as I have time.  To give me pleasure to look out on and be out in.  To develop character in facing adversity and frustration (that is, oxalis, onion-weed and some horrible grass-weeds).  To be such a garden that when this house must eventually be sold, people will rise up and say This must not be turned into shoddy developer's units. We must keep this eccentric and livable house for people to live in; for people who will also want to keep this wild cottage garden for everybody to enjoy and children to play in.  If the garden is full of plants there is less room for weeds.  Plants are given their chance, and from the ones that flourish I take cuttings and self-sown seeds to plant elsewhere in the garden, so it is basically a garden of 'What will grow here'.  I have a lovely theory that plants flourish from being looked at. They dont even need to be sung to or talked at. You just sit in the garden and watch them growing. Nobody is allowed to refute this beautiful theory.  When we first came here, parts of the garden had never ever been dug - the bushland still here in the 1960s was just bare or weedy earth. When we first dug these pristine areas of the hill-top site, the topsoil was mostly 1 centimeter deep, with clay below. (What a contrast Australian soil can be to our ancestral earth in Aberdeen, Scotland, where our garden was over 2000 years old, no fertiliser was ever needed, a stick grew if placed in the ground, and digging even five feet deep was still rich topsoil. No wonder farmers from Europe have been innocently wrecking this country.) We have composted and mulched, and now we can dig at least a spades-depth before reaching clay or grey powder.  The nature strip is planted with 'anything left over', and left to grow without watering or mowing. What survives, does. Cars can park on the gutter side, no matter, plants will grow again, and there is room for the bins to go out. What survives beside the two trees is agapanthus, 3 sorts of gazanias, five sorts of daisies (white, purple and yellow), Australian 'iris', jasmine, honeysuckle, periwinkle, freesias, watsonias, two sorts of iris, ixias, gladiolus, snowdrops, 'red ground-cover', a flowering succulent, vinca, geranium, forget-me-not, a sh! baby oak-tree, occasionally Australian century - and well, yes, some weeds.  The front lawn is being receded into a small place to park and clean a car, but in which two sorts of daisies and many clumps of freesias also grow. (And dandelions and grass-weeds.) The garden is for 'survivors' - what will grow with minimum watering. The frontage is mainly Australian shrubs plus bulbs and daisy undercover. Camellias, azaleas, prunus, exotics, climbers and a lemon tree grow against the fence and house, and other trees are a silver birch, ancient gum-tree and mini-dogwood. Low growing hardy plants are spreading up the grassy section of the drive. Sometimes 'fairy toadstools, red and white, grow under the birch, and there are many other fungi too.  Pot-plants. I always have cuttings and often seedlings growing - often self-sowns that I want to find out what they are. Some tomatoes in old drums where they get maximum sun, and flowering plants in tubs by the font and back doors.  The back garden is designed to be the view as you come down the passage, and to take in the trees behind the fence as part of the view, Japanese style. It full of about everything that will grow here (see list) - the once- lawn is now reduced to mere tracks and a dumping ground. There are three compost-heaps, one growing potatoes, one to take from and one for dumping. There are four black compost bins, one for worms and kitchen waste, two for general garden waste and one against a sunny wall will hopefully cook the green weeds in it. I am reminded of the story in the New Statesman once of the couple who got so keen on composting that the whole back yard was eventually taken over, tramps disappeared, and eventually the couple disappeared too.  Self-sown. I always check unknown spontaneous seedlings, because they have shown they can survive in our garden. - Hence a passion-fruit that was laden for four years until drought-stricken; tomatoes, potatoes, pumpkins, self-sown seeds from our flowers, the baby oak-tree, prunus, little black-hoods, arum lilies - and I am afraid, weeds.  Organic gardening. I have a bag each of lime, gypsum, blood-and-bone, potting-mix, a 'complete fertiliser' and a few other bits and pieces, and they last ten years, added to the compost as needed. I tried RoundUp for the oxalis, and it flourished more, so use no weedkiller, only exercise. For aphids I use soapy water and my finger-and-thumb. For a white cottony scale on the dogwood I used a kitchen detergent. For snails and slugs I occasionally use a night-patrol, and sometimes a snailbait round seedlings, protected from the birds. Occasionally a spray is needed for black spot on the roses. Occasionally I have to put down ratkiller when rats are eating my green tomatoes, and broccoli PLANTS down to the stalk, and the tips of the lemon-tree that grew from a pip.  The wild-life. See list. However, I worry about two things. i. The lack of insects - presumably through all my neighbors zappers. There still seem to be mosquitoes, flies and blowflies, but there seems nothing flying around to help my winter broad-beans or my early spring cherry-plum to set. ii. Protection of Australian predator birds seems excessive when small birds now have humans and their related killers - dogs, cats and cars - to take their place in the food-chain and ecology. Over the years small birds have disappeared from my garden, and the birds are now only crows, magpies, pigeons, wattle-birds, mynahs, kookaburras and lorikeets.  Water economy. I have three of my own Roof-water-diverters going from the down-pipes to where I want water. I start mulching in October, using mulch from gumtrees that had to be chopped when they became dangerous. I also use buckets from bathroom and laundry in summer - but wish that house-design now re-used clean grey-water, so that it could be diverted to the lavatory or for garden use as suitable.) I train the plants to use ground-water rather than surface-water and be generally tough by giving minimum water in summer, soaking a small area at a time if it needs it badly. What survives does, and it is amazing what does survive this spartan training. There is great pressure from developers to get rid of gardens and back-yards, on very excuse possible - including their waste of water. We must resist this. My city of Melbourne used to be called a Garden City. This is being threatened on all sides - public parks plantings at shopping-centres and even in the city centre turned to monocultures of job-lots to look like Arizona deserts, trees on nature strips mutilated top and bottom for cables and clear vision for cars. Everywhere children kept indoors. Even nursing homes are becoming multistorey so the old folk cannot even see a garden outside, let alone go out in one.What of the fresh air from gardens, and the loveliness, and the good health! In my Wild Cottage Garden there are over 200 different sorts of plants - many with names I do not know - plus eight regular bird species and 37 other sorts of creatures! As our erratic climate becomes more erratic and as our population grows, saving water becomes essential. Water tanks are now allowed for suburban gardens, but they take up space and can be expensive. The diagram shows a roofwater diverter installed at our home for watering the garden. The diverter allows rainwater from the roof to be diverted to any dry part of the garden at any time, by an ordinary garden hose or cheap agricultural plastic hose, If the garden is watered sufficiently or if there is overflow, the water can go straight down the downpipe. The water goes down the hose by gravity. The hose can be removed and outlet blocked at any time. A strainer (e.g.from a mesh tea-strainer) fixed over the outlet can prevent blockages, or, if necessary, leaves, silt etc. which collect at the bottom of the box can be removed easily. The diverter box could be placed high enough on the downpipe for a tank to be filled, or to allow higher parts of the garden to be watered by gravity. This sort of simple gadget could be produced and sold cheaply, so that people can install it simply by putting a section in a downpipe from the roof. If anyone makes a profit from it - give us a royalty which we will use for further conservation developments. A note on this invention was published in Alternative Technologies . that vermin cannot enter, and that can save you wasting plastic bags as bin liners for your kitchen rubbish. For all food scraps except bones, citrus and tealeaves. This simple design for a home-made worm farm is rat-proof, and fits a small shady space. All you need is an empty plaster-can and two cheap plastic garden sieves. Builders and plasterers at a building site will give you a can rather than throw it in a rubbish skip. Place one sieve in a flat space in damp ground, about 5-10 cm deep. Cut the bottom from the can. Place the can on the sieve. The sieves stop rats, mice and blowflies getting in, but allow worms perfect freedom to come and go from the earth. A few fruit-flies do not matter. Start off the worm-farm with some damp earth with a few worms in it. They will multiply quickly, so no need to buy worms. Then all you do is add your kitchen scraps – but no bones. Worms don’t like citrus, egg-shells or tea-leaves much, so put those in the compost. After a few weeks, for some rich fertiliser from the garden, just lift the can and take some from the bottom, full of worms. Shift the farm around the garden if you like. Advantages. Only bones need go in the rubbish-bin. No food-scraps in the compost-bin or compost heap to attract rats. No waste of empty plaster-cans. No smell. Suggestions. Neighbours in flats can share a worm-farm. Builders need not waste empty plaster-cans, but put them outside a site to be taken. Paint and plaster cans are useful for gardening buckets too, and for making liquid manure. Councils could advertise or sell these very cheap worm-farm kits, as well as the more expensive commercial worm-farms that many do sell. Then everyone could afford one. 1. January 2001 A Mysterious Bird was stepping daintily around the ruins of our jungly and unwatered back-yard, seeming unaware that I was watching him. legs a bit longer than a wattlebird, and made very distinctive by bright orange around its eyes and round the back of its neck, with black and white also around its eyes, and variegated brownish-greyish wings and banded throat and stomach. Its mate did not appear to have the orange, white and black around its eyes and was altogether more demure. It sat for an hour under some vinca leaves - and I hoped it would not nest there because we have rats from the school next door. Two days later, the Mysterious Bird appeared again, strolling around quietly with its ? mate, and it was possible to watch them from quite close as they seemed quite self-possessed and unjittery. But when I went to get a sketchbook and camera they had gone. Over the summer there were up to six Banded Rails appearing in our back yard. They are well camouflaged, and you usually hear them scuttling in the undergrowth before you see them. The first to come were two adults, one with orange neckwear, and than later four smaller ones (younger?) like little bantams with striped stomachs and Cleopatra eye-makeup. They scuttle around, and I could get to within one foot of them. This lack of fear may make them vulnerable to cats and rats, especially as they are basically ground birds and probably ground-nesting. I think these swamp birds may have come because our back yard is a bit like a deserted wilderness just now - very home-like for them. Later there were just three birds rustling around in the garden, and then one that became quite tame, and the other two occasionally appearing. I left out a little budgie seed for them from time to time but not enough to make them dependent. I saw them eating seeds from the grasses. The 'tame' one once ate out of my hand. I never heard them make a sound - only the rustling in the undergrowth. When frightened, they did not fly, they ran, with their heads bobbing forward and their tails going up and down like bantams. when they flew, their legs trailed. The tame one sometimes sat on the roof and came down when it saw me. It liked having a bath in the small bird-bath - flapping its wings. Or just standing in the water. After George died, it was comforting to have the little bird appearing in the garden every day. It also went next door, which had a native garden. In March came the first cold snap. I saw the little bird parading outside our back window for about half an hour. Then I never saw it again. I hope it had gone to warmer climes, and had not been taken by any predator. Description. 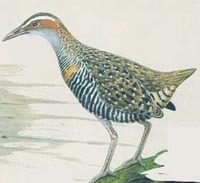 A pretty, dainty bird, Smaller than a bantam but behaving very like one - with long thin beak and legs, Cleopatra eye-makeup, with white and brown around eyes, banded black and white thorat and stomach with orange cummabund half-way down, and browny-black-white- mottled back feathers like a brown duck. From Bird Book. Simpson and Day, 182. S & D says that their habitat is "grassy, reedy or thickly vegetated areas, usually close to water."